Chances are, you’ve heard of BCAAs, aka the Branched Chain Amino Acids. Those magical, mysterious letters are seemingly everywhere in the supplement universe; often plastered in vivid color on nearly every jug of protein powder, pre-workout, and amino acid-based recovery drink. And the claims attached are lucrative. I’m having visions of the the 4, 8, 15, 16, 23, 42 sequence in LOST. But unlike most of the garbage that’s veiled by proprietary blends and tossed into the myriad workout cocktails circulating GNC, BCAAs aren’t all hype. And they’re not a filler ingredient. They actually have real, tangible benefits, and can provide a lift for anyone that trains regularly, including increased muscle growth, turbocharged endurance, improved body composition, and significantly reduced post-workout soreness — both for the casual lifter and seasoned vets alike. We’re digging deep, sifting through the shelves, and ranking 54 of the most popular BCAA supplements. Giddy up. Let’s get alphabetical. What Are BCAAs and Why Are They So Special? The Branched Chain Amino Acids are a group of 3 essential amino acids, specifically: leucine, isoleucine, and valine. They make up about 40% of the TOTAL amino acid content in the body—the largest of any group—with about 18% concentrated in muscle tissue.1 You already get an influx of BCAAs naturally from dietary protein sources and protein powder, but supplemental amounts can carry major benefits. First, a little context. While most amino acids are first broken down and processed by the liver, the BCAAs are unique in that they shuttle straight to muscle cells. They’re a direct line of fuel, which has MAJOR perks — both on performance and muscle growth. Their primary impact: protein balance. Your body is a ridiculously complex ecosystem. At a very fundamental level, constructing new muscle tissue comes down to protein balance. The body is constantly churning through amino acids (from the protein you eat). When your muscles are flooded with amino acids and in a blissful state of surplus, they use the excess to synthesize protein, which enhances recovery and ultimately helps build new muscle tissue. But when you’re undernourished and/or working out excessively, which creates a deficit, the body uses the AAs it does have for energy production and general functioning (read: not gains). Worst case, it actually starts breaking down existing muscle tissue to steal the amino acids it needs. Unless that protein balance stays at a net positive, you WILL lose muscle mass over time — and that’s why eating a waterfall of protein everyday is so critical. Think of your amino acid pool as a bathtub without a drain plug. Your amino acids are constantly being drained, especially during exercise. The only way to keep it full is with a steady stream of new amino acids. We’re talking buckets on buckets, in the form of HQ dietary protein or supplementary BCAAs. Simplified: when protein synthesis > protein breakdown, it enables the body to build muscle. When it’s flipped, you start to lose muscle (catabolism). Protein breakdown happens when your diet is carb-heavy and low in protein (i.e. America), you’re in a fasted state, or in a chronic caloric deficit from dieting. You’re not getting the amino acids required to support muscle growth. But let’s say you’re a protein-chomping powerhouse. For anyone who exercises religiously and trains like a beast, amino acid depletion and muscle breakdown happen naturally as a direct result of intense training. Distance cardio, incendiary workouts, and marathon training sessions (usually >1 hour) all quickly deplete the body’s energy stores; namely glycogen, your stored source of carbs. But once those tanks are empty—depending on duration and intensity—it starts dipping into your amino acid pool. And that’s where the issues begin. Think about how most people approach weight loss. They slash calories and hop on the elliptical for an hour. It works, but it’s a horrible strategy, mainly because you’re churning up muscle tissue in the process. Sure you’ll lose weight, but if a large chunk of that is muscle, your body fat percentage might actually increase. 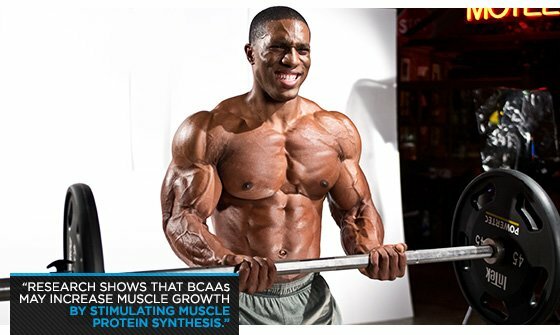 Your strategy: shield your muscle with an infusion of BCAAs. (1) They actively prevent muscle loss (catabolism), especially when you’re fasting, cutting calories, doing a ton of distance cardio, or engaged in long training sessions. BCAAs can help buffer muscle tissue whenever your amino acid stores start running low — that’s why they’re often recommended for people on low calorie diets and as an intra-workout supplement. That’s why you should be taking them before an intense workout, and during a marathon sweat session. You’ll go harder, LONGER. Ultimately, that helps increase overall training capacity and volume — it also makes the squats you did so much more bearable a day later. You’ll barely feel a thing. We’ve only included products that are primarily BCAA driven; for powders, that means >4g of total BCAAs per serving (there’s a full-blown market for broader amino acid blends). For convenience, we’ve broken out the rankings into flavored powders, unflavored powders, and capsules. Every product class has its individual flaws — flavored powders are mostly gushing with artificial sweeteners and dyes; unflavored powders taste utterly repulsive; and if you’re taking BCAAs in capsule form, you’ll need to down 10+ pills just to get an adequate dose. We recommend taking a flavored powder that sits on the natural end of the spectrum. Unflavored varieties are REALLY hard to stomach. Like, I-need-to-vomit-everywhere bad. But hey, if you’re game, it’s a healthier route (try tossing a scoop in a glass of OJ, or anything else acidic). Dosing: As a general guide, we recommend a BCAA supplement for anyone that consumes inadequate protein and/or that follows a rigorous training schedule. Take 5-10 grams of BCAAs pre- and post- workout. You can also guzzle a serving during the day to optimize muscle growth (especially if you’re cutting calories or fasting).